Shop online for over 200 detail-master plastic models at discounts up to 47%. This is a Sheet of #1 Ignition Wire Looms for 1/24-1/25 scale models. It's from Detail Master for ages 12 and over. This is a 1/24 - 1/25 Scale Black Wired Distributor Kit from Detail Master. It's for average to advanced modelers. 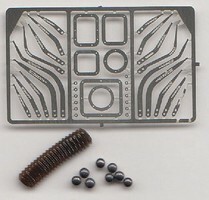 This is a Battery Hardware Kit for 1/24-1/25 scale plastic models. It's for advanced modelers ages 12 and over. This is the 1/24-1/25 Scale Hurst Shifters with Knobs from Detail Master. This is a 1/24-1/25 Scale Package of Carburetor Linkage and Hardware Parts from Detail Master. It's for advanced modelers. This is the 1/24-1/25 Scale Seat Belt Hardware by Detail Master. It's for beginner to skilled modelers. 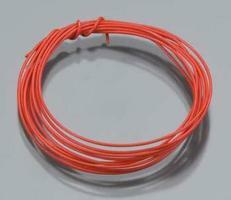 This is a 2' Red Battery Cable for 1/24 - 1/25 models. It's made by Detail Master for advanced modelers. 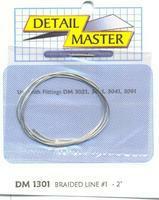 This is a package of (#1) Braided Line from Detail Master. For use on plastic model cars. This is a 1/24-1/25 Scale Package of Hose Clamps from Detail Master. It's for average level modelers. This is a 1/24 - 1/25 Scale Yellow Wired Distributor Kit from Detail Master. It's for advanced modelers. This is a 2' Black Battery Cable for 1/24 - 1/25 models. It's made by Detail Master for advanced modelers. 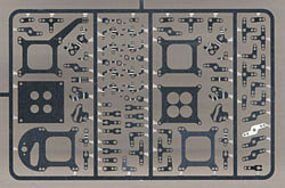 This is a 1/24 - 1/25 Scale Detail Master Set of Photo-Etched Radio Faces Parts for Model Car. It's for average/advanced modelers. 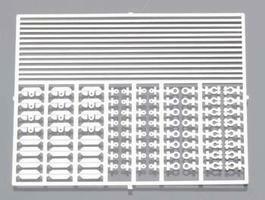 This is a Hood Pin kit for 1/24-1/25 scale plastic models. It's made by Detail Master for ages 12 and over. It's for beginner to skilled modelers. This is the 1/24-1/25 Scale Compression Fitting #1 (8pc) by Detail Master. It's for beginner to skilled modelers. 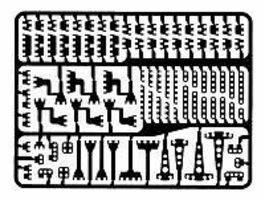 This is a 1/24 - 1/25 Scale Detail Master Set of Photo-Etched Engine Brackets for Model Cars. It's for Advanced Modelers. This is a package of (#3) Braided Line from Detail Master. For use on plastic model cars. This is an 8-piece set of #3 Compression Fittings from Detail Master. Used for 1/24, 1/16, 1/12, and 1/43 scale models. For ages 12 and over. It's for beginner to skilled modelers. This is a 2-set package of 11" Drilled Vented Disc Brakes for 1/24 scale plastic models. It's for advanced modelers ages 12 and over. This is a Detail Master 1/24 Scale 5" Diameter Competition Style Tachometer. It's for modelers of average skill level and above. This is a package of (#2) Braided Line from Detail Master. For use on plastic model cars.